Having reviewed the Edaname Beans Protein Pot, we thought we would try out the Egg & Soinach version. 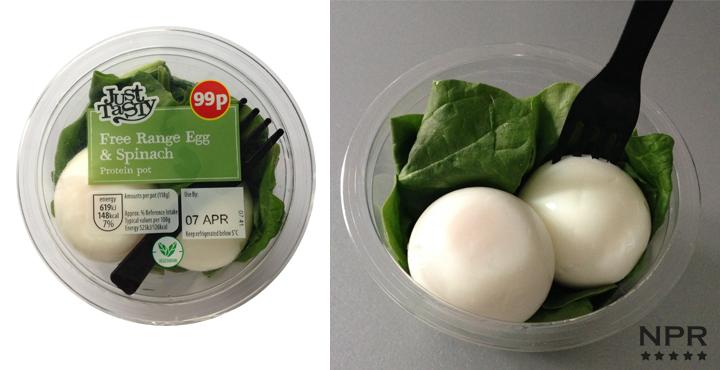 Unlike the other Protein Pot, this one has no condoment, no sauce to go with it, its just a straight up 2 Boiled Egg and various sized(up to 8cm X 7cm) Spinach leaves, I counted approx. 27 in all. So what can I say? The Spinach leaves were fresh but had a salty tint taste to them giving them an extra kick, the eggs(5cm in length) were alright, fresh tasting. Together its just like eating egg and leaves, what more did you expect? I guess this is just a 15g Protein boost but its crying out for a salad dressing pouch or something. I had to put some rich mayo on mine to finish it off. What do I think of it? Well, its not for me really but I guess workers on their lunch break in need of a Protein boost might see value in it.